We’d love your help. Let us know what’s wrong with this preview of What Is Found, What Is Lost by Anne Leigh Parrish. To ask other readers questions about What Is Found, What Is Lost, please sign up. In What is Found, What is Lost, Anne Leigh Parrish has crafted an elegant and powerful novel that explores the intricacies of family and faith. It is a heart wrenching tale of four generations of women forged, in part, by their relationship to faith and how each’s connection to their beliefs affects the succeeding generation. The main characters are strong pragmatic women vividly drawn. The story of their relationships and quiet tragedies lingers long after the last page is turned. Ms. Parrish’ In What is Found, What is Lost, Anne Leigh Parrish has crafted an elegant and powerful novel that explores the intricacies of family and faith. Ms. Parrish’s vibrant prose guides the reader through the story with a deft hand. No mean feat in a story set in so many places across so many years. She handles the challenge brilliantly and in its languid execution has lessons to teach. Simply put, What is Found, What is Lost is a novel on par with the best in American letters. As a debut, it is a tour de force that demands serious attention. Pick it up. You will not be disappointed. I have never read anything quite like "What is Found, What is Lost" before, and it was so wonderful to read something unique. I was captivated by the lives of Freddie, her grandmother Anna, and her mother Lorraine. Anne Leigh Parrish writes in a way that is both interesting and fluid - it's easy to get drawn in and picture everything that is happening with each chapter - whether Freddie is rinsing out a glass of water or Anna is scolding her servant. I felt like I was right there inside the stor I have never read anything quite like "What is Found, What is Lost" before, and it was so wonderful to read something unique. I was captivated by the lives of Freddie, her grandmother Anna, and her mother Lorraine. Anne Leigh Parrish writes in a way that is both interesting and fluid - it's easy to get drawn in and picture everything that is happening with each chapter - whether Freddie is rinsing out a glass of water or Anna is scolding her servant. I felt like I was right there inside the story in a lot of cases. There were a couple of transitions in the storyline that kind of felt 'jolty' - the one that stands out is *spoiler alert* when Anna runs away with Olaf. I felt like there should have been a little more story to give more reason to that choice. But overall, the imagination and creativity in the stories of these four women was wonderful. They act in a way that usually makes sense, even if I would never consider making the same decision. I was frustrated by Freddie at times, because I felt like she held onto the trials of her life a bit too much, but I could still put myself in her shoes. Anna's story was fascinating to me (I am a historical fiction nut, so that could be why), and although her experience was quite foreign to me, I understood where she was coming from for the most part. I couldn't stand Lorraine, but I was able to see a way to justify some of her actions. Beth was more of a mystery to me, because her story was so opposite my own, but I could relate to a lot of her thoughts and some of her feelings. I would have liked to get more of a look into Beth's, life. I felt like I didn't quite have enough to really understand her and where she was coming from with some of her decisions and interests at the end of the book. I'm struck by the talent that Anne Leigh Parrish holds. She is a true master of words, able to place the reader in the middle of the mundane while making it all seem new. Parrish has done a fantastic job of creating authentic characters, both good and bad. I found that the younger two generations of Freddie and Beth resonated with me more than the older two women, Anna and Lorraine. I'm not exactly why that is the case, but I do know that Lorraine was an especially difficult character to enjoy. I'm struck by the talent that Anne Leigh Parrish holds. She is a true master of words, able to place the reader in the middle of the mundane while making it all seem new. Parrish has done a fantastic job of creating authentic characters, both good and bad. I found that the younger two generations of Freddie and Beth resonated with me more than the older two women, Anna and Lorraine. I'm not exactly why that is the case, but I do know that Lorraine was an especially difficult character to enjoy. Freddie is undeniably the "star" of the book, however a large portion of the novel is actually about Freddie's mother, Lorraine, and her grandmother, Anna. By introducing the past generations, it feels as if Parrish trying to understand Freddie's modern situation by looking to the "sins" of the past. It's a bit of a stretch, which might explain why I didn't care as much for the two older characters. In the end, however, this look back does shed light on Freddie and the generational family dynamics, as well. While this book centers heavily around each generation's search for God, I don't feel it really is about God and religion at all. Although several religions are featured in this book and the woman chasing each religion is changed, in the end What is Found, What is Lost is about the women themselves. Each woman is actually searching for themselves, a perfect identity, a reason to believe in themselves. What is Found, What is Lost is more about the human condition, and a search for love and acceptance, sometimes at any cost. The latest offering from Anne Leigh Parrish manages to be totally unique while also calling to mind the work of Alice Munro and Flannery O'Connor. Unexpected events unfurl through the lives of four generations of women, bringing love and heartache in their wake. The mystery of human attractions and interactions lead to twists of fate that stymie mothers and daughters as they struggle to understand themselves and their needs. This is a lovely book that I highly recommend to all literary readers. Anne Leigh Parrish is back, with her latest novel What is Found, What is Lost releasing on She Writes Press. I was very excited when I received a review copy of this book in the mail last month–Parrish’s writing career is something I’ve been following since she first submitted and was published to Literary Orphans Journal two years ago. updated-novel-coverIf you are familiar with her style and interests, you know that Parrish is an expert at writing about the inner workings of a family. This is g Anne Leigh Parrish is back, with her latest novel What is Found, What is Lost releasing on She Writes Press. I was very excited when I received a review copy of this book in the mail last month–Parrish’s writing career is something I’ve been following since she first submitted and was published to Literary Orphans Journal two years ago. updated-novel-coverIf you are familiar with her style and interests, you know that Parrish is an expert at writing about the inner workings of a family. This is good news for me, a die-hard Updike fan. Yet Parrish takes her own spin on it—she covers a family’s rise and fall, triumphs and failures, from a deeply diverse, multiple-character lens. This novel continues on in that fantastic tradition–but focuses on an even deeper analysis, as it covers four different generations of women as they mature and intersect and haunt one another in the American Midwest. Let me backtrack for a moment and talk about the structure and composition of the novel. The book is gorgeous—it has a matte, good-feeling, almost rubbery cover that will make you think of a night in the early fall an hour after the sun sets and the sky forces you to remember that it is cosmic, overwhelming you in an inky blue. On the cover we see a woman in a white dress, perhaps a wedding dress, with a type of shawl over her head—a lot of foreshadowing there—and she seems to be glowing as she looks up into the sky. This otherworldly white and blue is carried on to the thin title font and the back-cover font, where we see a great 6-pointed orange star (representing Chicago?) heading off the text. The paper is of good stock, and the ink is great quality as well–you’ll notice in the large font of the chapter-headings, the ink is shining just a bit above the height of the page. The book clocks in at about 250 pages. The mechanical structure of the book is divided into four parts plus a brief epilogue–each chapter, of which there are 41, takes us back and forth between the generations of women and their interactions with one another–no one part is exclusively dedicated to a generation or a time. With this we get a grasp of the ever-present fluidity, the ever present sense of ghost that exists within What is Found, What is Lost. The chapters themselves read at most times like flash, and have a Dybekian quality to them. They hit you hard and fast before you get comfortable, and as you go on to the next chapter, you get another lens shift into a different time and place. We start off with Freddie, a fresh widow of a cop who died of cancer, in the year 2012. We’re in Sioux Falls, South Dakota and we’re walking a designer dog down the street. Freddie’s mind wanders to her dead husband, and her daughter, Beth, who has been stripping in Nevada to make a living for herself and her young son and to—Freddie is sure–incense her now dead cop father. Immediately we are aware of the main themes, as in this chapter and the next we understand that Freddie is used to being alone, likes it, finds a peculiar freedom and spontaneity in loneliness. As Freddie walks her dog, a strange man in a pickup is chugging down the small streets. All her neighbors are concerned that he is dangerous. Freddie invites him in. That’s when we learn the second thing about Freddie–that she is not afraid of confrontation. Over the next few chapters we are introduced to our protagonist’s mother, Lorraine, who was a true believer (and a drunk) that raised Freddie and her sister Holly in religious camps and exclusion–devoid of schooling and healthcare. We learn about this true believer’s own mother, Anna, the Armenian who fled Constantinople with her Jewish husband, and through a series of events finds her way to Chicago without that Jewish husband. We will step back and learn more about the man in the pickup truck, Nate, whose wife converted to Islam and left him—Nate, who drives around the streets day after day looking for a woman in a hijab. We’ll learn about the youngest woman–the fourth generation–and her affair with a priest. Now you are seeing the other main theme of this novel, the struggle with religion–a theme that holds a lot of interest for me personally. We have two discontinuous generations of powerful women who are unbelievers, and we have their daughters who in some way have a type of thermidorian reaction and are pulled into a search for religion and a lust–an actual, sexual, lust–for it. It shows us that religion is not only about believers and atheists, even if it would be simpler that way for me to think so. We learn about the impact of personal belief on those around the person with the belief, the impact on future generations and how they choose to explore this part of themselves (or not). It is about the weight of cultural inheritance. It is also about radical religion as a vehicle–a form of escape, of the sort that Max Weber outlined in his analyses of the American West–a land where 150 years ago without generations of roots and tradition, new ideas and new religions and new cults thrived. What is Found, What is Lost is about the intersectionality of womanhood throughout four generations, where it is about the impact of religion on those generations–it is also about much more—the small infinities and events that make up a family’s cultural inheritance. It is about the PTSD of the lost World War One generation. It is about struggles of faith in romance as much as in religion. It is about small-town politics and it is about a criminal element and how families will sink to it to make a profit. It is about being the messy savior of a people who oppressed you, and the hollowness of being saved. What is Found, What is Lost, is about sisterhood late in life and dealing with a family-member’s stroke, and it is about divorce and false love. Most looming–to me at least, as a Midwestern writer and reader–it is about the presence of the prairies and the snow and the small-towns and that particular sort of person you find hunkered down in them during the long winters. We get four beautifully chaotic generations of them. And man, do we get it. Pick this one up. Highly recommended. I started this book slightly ambivalent, believing it would focus heavily on religion and its role in the characters' lives. I was gladly relieved to find this was not the case. Religion and faith does have an impact on the women featured in this book, but it isn't at all the central theme. Rather, this book considers faith in all its forms. Religion is definitely a driving theme, but also presented are the effects of faith in family and in oneself. Freddie is the first person we're introduced t I started this book slightly ambivalent, believing it would focus heavily on religion and its role in the characters' lives. I was gladly relieved to find this was not the case. Religion and faith does have an impact on the women featured in this book, but it isn't at all the central theme. Rather, this book considers faith in all its forms. Religion is definitely a driving theme, but also presented are the effects of faith in family and in oneself. Freddie is the first person we're introduced to, and as the story progresses, we begin to understand why she seems self-sufficient yet also a pillar of strength through her background and through revelations about the past experiences of her grandmother, the past and present circumstances of her mother and the current struggles of her daughter. The story also involves Freddie's sister and her grandson, and every character struggles with something, whether it be accepting religion or merely understanding their own worth. Each person feels bereft of something. Perhaps that is why I couldn't get too immersed in the story.. I felt bereft too and at times felt so lost looking for what they were trying to find. Maybe that's a point of this story, though, that I was suppose to discover for myself. If so, I've realized too late.. The character I liked learning about most was Beth, Freddie's daughter. She was a wild child, leaving to live what could be deemed a life of sin, eventually adding a child to the mix and returning home and bringing along her more questionable choices. She presents a look at motherhood different than what the other women do. She's not overbearing and fanatical nor does she seem reliant on some omnipotent being to point her in the right path when it comes to child-rearing. She's not necessarily a hands-off parent, but her choices can be viewed as potentially damaging to her child. I wished there had been greater insight into her life. Lorraine and Anna were also interesting although it took me awhile to figure out their roles and relationship to Freddie, and by the time I was able too, I was already too detached to care. Anna, Freddie's grandmother, pursued a man and lifestyle that may be considered quite unexpected and inappropriate during her time. She was impulsive yet resourceful. Her choices led to a difficult life and some regrettable situations, and perhaps this was another aspect that confused me about this book. I kept expecting some infusion of religion for her, whether to let Anna see the error of her ways or to force her to face some sort of penance, but it never came. Also, her experiences were presented and I couldn't find a connection to how they affected the lives of the newer generations. Anna's daughter, Lorraine, turns to religion devotedly perhaps because the people she meets in that environment give her the attention she is looking for. She's a sort of hypocrite, though, and it's hard to find any redeeming qualities in her. It took me a while to figure out what was happening in the book. When the story changed perspectives or time periods, it was hard for me to figure out who was speaking about whose experiences and the role the played in the others' lives. The changes in time and place of when events happened confused me at first, and the jumps made it difficult for me to track events. After I realized the main characters were four generation of women from the same family, it started to make more sense, but by then I was already pretty deep into the book and was finding it difficult to hold my interest. I think if I were to re-read this book, I might appreciate it more and find more meaning, and maybe I'll be able to do so in the future. 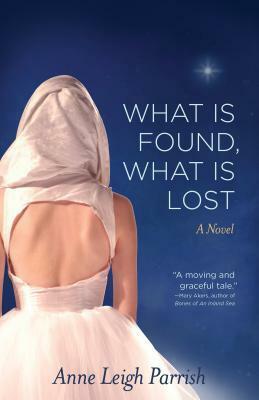 What is Found What is Lost: A Novel by Anne Leigh Parrish is a splendid, rich, and deeply thoughtful journey through the lives of the women of one Midwestern family. They seem eerily similar, not particularly interested in being mothers, and treating their children badly, trying to get along with men who are complicated and mostly unresponsive. They either feel too passionately or act the stoic, holding everything inside. This is not a story about religion or faith. It is not an “inspirational book,” nor a Christian book. This is a multilayered series of stories about women trying to find themselves through their encounters of every sort of distortion, anomaly, seen in “religious people: those who love religion, hate religion, pretend to be people of faith, in other words, hypocrites. As in life, these misfits come in every religious group. The tapestry of this family is sewn, loosely, imperfectly by these outsiders, and therein lies the novel’s captivating charm. Freddie, the newly widowed central character, ties together the generations. First Lorraine, her abusive, alcoholic mother, shows up, having been sent home by the lecherous tent preacher who’d lured her into running away from home to spread the “Good news” decades before. She’d abandoned her daughters, Freddie and Holly, in the tent community, left them to fend for themselves, nearly illiterate, unkempt, and hungry. Before Freddie married Ken, a cop, she told him what she knew of her background, and he was not turned off, but resigned, stating, ”I’m a cop. I’ve seen everything.” Apparently, Ken and Freddie argued a great deal, he resenting her working at a grocery store, she determined to show resolve, forbearance, and sometimes, silence. When they had their daughter Beth, Freddie was dutiful, but sometimes cruel and demanding, never affectionate. Freddie seems to be the one to come home to, so Holly and her husband visit, bursting with plans for a car, a new home, and other material things. The homecoming of the daughter, Beth, nearly unnerves Freddie. Beth ran away as a teen, worked in a questionable place, and has a son, whom she virtually ignores. She announces that she is pregnant; the father is a married priest. Anna decides to go to confession in a Catholic church . A list of sins flows rhythmically: divorce, living in sin, reconciliation, failing her child. When the priest counsels, “You must find you way back to God,” Anna thinks, Not back to God, To myself. Anne Leigh Parrish has brilliantly come through with her carefully crafted saga, which totally captured my attention. This is a superb novel, written by a gifted author who carefully fills out her characters with creativity and imagination. Let me start out by saying that this isn’t the type of book I normally read. I love my action, thriller and mystery novels with fight scenes and webs of intrigue. So it’s fair to say that I was a little bit doubtful about a book based solely on the characters’ lives. And, as a result it took me a little while to really get into the book, but once I put my preconceptions behind me I was hooked. The lives of the characters’ drew me in. There was no strong plot like I was use to, it simply the story Let me start out by saying that this isn’t the type of book I normally read. I love my action, thriller and mystery novels with fight scenes and webs of intrigue. So it’s fair to say that I was a little bit doubtful about a book based solely on the characters’ lives. And, as a result it took me a little while to really get into the book, but once I put my preconceptions behind me I was hooked. The lives of the characters’ drew me in. There was no strong plot like I was use to, it simply the story of the characters lives pushes you forward to find out more. To try and answer the ‘why questions’ that pop up along the way urges you on. The narrator’s point-of-view jumps between characters, place, past and present. And although this might sound off-putting, it’s actually the complete opposite. It allows you to gain a deeper understanding of what unfolds via each character’s take on a situation. Some characters hate others for the way they’ve been treated, but with the change of perspective you get an insight into why a particular decision has been made. For me it made the read much more interesting, you weren’t given one viewpoint and asked to stick with it, you were shown each person’s ‘truth’ of the situation. As for the writing itself it both gave a great sense of place and character. Giving away plenty of detail while leaving just enough out to let the reader’s imagination fill in the gaps. Like life, loose ends aren’t always tied into a neat little bundle, and what we are told and what actually happened aren’t always the same. In some cases, you make up your own truth or may never know at all. The book in essence, has the underlining theme of faith. The religious term of faith is threaded strongly throughout the story, but it is more than faith in that sense. It’s about faith in one’s self and how the decisions you make impacted on the lives of others. Each of the characters are flawed and are battling their inner demons while simply trying to make their way through life. It’s also about the impact a parent has on their children and the role their own history plays in how they raise them. The view we have of our parents may not always be the full truth and what we see is the result of a life we might know nothing about. This life before their children results in expectations that may never amount to anything. Ultimately, I think it raises a question of whether or not children pay for the sins of their parents? By the end of the book, I was easily lost in these character’s lives coming to grip with their place in the world. If there is anything negative to say about the book is that it finished way too quickly. I found myself wanting more and I really hope that Anne writes another book that lets us know how the characters are getting on. In this novel, Parrish explores the themes of motherhood, identity, and religion through the eyes of main character Freddie, as well her mother, grandmother, and daughter. Freddie is one of the most delightful female characters I’ve read in some time, despite Author Anne Leigh Parrish has contributed to Writer’s Bone (including a short story, an essay, and an interview), so I was certain I’d like her latest novel What is Found, What is Lost despite the fact I’m not exactly the target demographic. This review has been hidden because it contains spoilers. To view it, click here. Four generations of women are woven through the years, connecting them all by the common bond of love and faith. mother, Lorraine, along with her sister Holly. The years unfold exploring the lives of Lorraine and her mother Anna. Religion , marriage. relationships, and the continuous bond of love are the c Four generations of women are woven through the years, connecting them all by the common bond of love and faith. "In "What Is Found, What Is Lost," Anne Leigh Parrish ruminates on faith and lack of, as well as family and love. With writing akin to the comfort of a conversation over a familiar kitchen table, she takes us on a journey through the years—both skeptical and believing, both hard and bright—to get to the hearts of these women, marriages, mothers and daughters, these relationships. Parrish isn't afraid to let us drift to the darkness, but we can trust that we will find her on LIKED IT! BLURBED IT! A multi generational story that takes you back and forth through four generations of women and each of the issues they have lived with and tried desperately to overcome. Freddie is the main character of the four and with her daughter, mother and grandmother each telling their stories and the moments that make up their lives. I am so glad that news of this incredible novel was spread to me, and i can't be happier i made the decision to read it. Parrish writes so eloquently a tale of love, family, faith and religion. Masterfully written is this poignant novel which leaves you not only thinking, but makes you crave more. What is Found What is lost will not disappoint, be sure to make this one on your list of must reads. This is the story of four generations of women–though not told chronologically–and their struggles with faith. From different places and different circumstances, they each had to face their own feelings and beliefs, as we all do, I imagine. Anyone who has ever struggled and even anyone who feels they have not ever wavered should read this book. I received this book from Goodreads Giveaways in exchange for an honest review. Realistic and pretty relatable characters, but also too easy to set aside. This book fell a little flat for me. Read my full review at A Lovely Bookshelf on the Wall. fascinating, Engaging & Refreshing!!! A Remarkable Read!! !